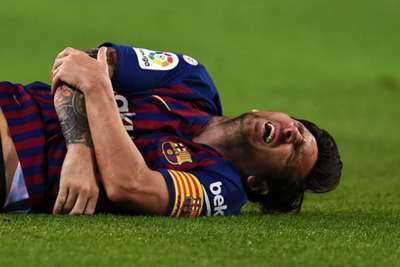 Lionel Messi suffered a fractured arm after an awkward fall in Barcelona's 4-2 win over Sevilla on Saturday and he stands to miss some crucial matches as a result. He was given medical attention for several minutes on the touchline, with Barca's trainers putting a significant amount of strapping around his right elbow. But he was unable to continue and Barca confirmed shortly after full-time that he had suffered a broken arm, ruling him out for three weeks. Ernesto Valverde's men return to European action on Wednesday having won their first two Group B outings, though Inter - who also have a maximum six points - will surely provide a real examination of Barca, particularly without their talisman. Undoubtedly the biggest game Messi will miss is El Clasico next Sunday. Regardless of their Champions League encounter with Viktoria Plzen, Madrid will travel to Camp Nou in a desperate mood after suffering three defeats in their last four LaLiga outings. Reports say it is do or die for Julen Lopetegui - with Messi set to miss this fixture for the first time in 11 years, has the coach just been handed his greatest lifeline? Barcelona begin their Copa del Rey defence at the end of the month, though the absence of Messi should not prove too much of an issue given they face third-tier side Cultural Leonesa. Even if they were to suffer a shock defeat, they will have a second leg in December to make amends. Providing Rayo do not enjoy a significant upturn in the next two weeks, Barca again should be able to cope without Messi at Vallecas, where they ran out 5-1 winners on their last visit in March 2016. The five-time Ballon d'Or winner did net a hat-trick on that occasion, however. It remains to be seen how Barca's Champions League group looks ahead of their trip to San Siro, but there can be little doubt that this will be their trickiest away match before the knockout phase. Given Messi has been given an approximate recovery time of three weeks, there is every chance he could also miss the visit of Betis, precisely 21 days after suffering his injury and just before the next international break. Nevertheless, the Andalusian club have not won at Camp Nou in any competition since August 2005.